LIBREVILLE, Gabon, June 27, 2012 (ENS) – The President of Gabon today set fire to the country’s government-owned ivory stockpile, sending a message to elephant poachers that illegal wildlife trafficking will not be tolerated in the Central African country. 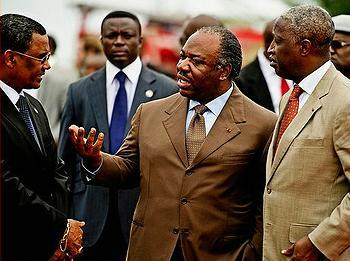 “Gabon has a policy of zero tolerance for wildlife crime and we are putting in place the institutions and laws to ensure this policy is enforced,” said President Ali Bongo Ondimba, who ignited the pile of ivory in Cite de Democratie, Libreville. President Bongo said his government would work with the Department of Justice to ensure that people committing wildlife crimes would be prosecuted and sent to prison. Over half of Africa’s forest elephants live in Gabon, a population estimated at 50,000 animals. Gabon’s elephant herd has remained relatively stable, but in the past year, two elephant massacres were detected by staff of the Gabonese National Parks Agency, Agence National des Parcs Nationaux, ANPN. In response to growing pressure from armed gangs of poachers, in May the Gabonese government created a 250-man special armed force within the national gendarmerie, to reinforce the ANPN staff. The global conservation organization WWF and the wildlife trafficking watchdog group TRAFFIC worked with Gabon to audit its ivory stockpile before it was destroyed to ensure that all tusks were accounted for and none had leaked into the illegal trade. The audited ivory stock totaled 4,825 kilograms (4.8 metric tonnes), including 1,293 pieces of rough elephant tusks and 17,730 pieces of carved ivory. Elephant conservationists hope that burning government stockpiles, as Gabon did today, will make it impossible to sell government ivory on the black market. 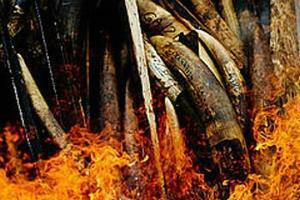 In the past, Kenya has conducted two such burns of government-held ivory – in 1989 and again in 2011. “If not managed properly, ivory stockpiles in the hands of government suddenly get legs and move into illegal trade,” said Tom Milliken, ivory trade expert at TRAFFIC, based in the UK. TRAFFIC says Zambia lost three metric tonnes of ivory from a government storeroom last week, while Mozambique lost more than a tonne of ivory from its stockpile in February. Elephant poaching levels are the worst in a decade and recorded ivory seizures are at their highest levels since 1989, according to a report published June 21 by the Convention on International Trade in Endangered Species, CITES. The findings, based on information submitted by governments, will be discussed at a CITES Standing Committee meeting to be held in Geneva in July. The report shows a close parallel between trends in elephant poaching and trends in large-scale ivory seizures, detecting similar patterns at different points in the illegal ivory trade chain. On June 19, INTERPOL announced the results of its largest ever transnational operation targeting criminal organizations behind the illegal ivory trade. 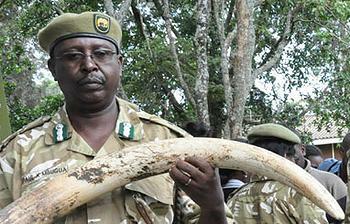 More than 200 suspects were arrested and nearly two tonnes of contraband ivory were seized. The three-month long operation involved 14 countries across Eastern, Southern and Western Africa. Some 320 officers from police, customs, environmental protection agencies, veterinary services, airport security, ministries of tourism and national prosecuting authorities took part. Firearms including AK-47s, G3s and M16s were seized by law enforcement officers during the interventions carried out at markets, ports, shops, border crossings and during roadside checks. In addition, on June 22, the Kenya Wildlife Service Canine Unit acting with police and customs officials at Kenya’s Jomo Kenyatta International Airport in Nairobi intercepted 345 pieces of raw ivory weighing 601 kg destined for Lagos, Nigeria via Ethiopian Airlines. The ivory, packed in six crates and sprayed with pepper to prevent dogs from sniffing it, was further wrapped in aluminium foil. CITES Secretary-General John Scanlon praised these efforts but said, “they must result in prosecutions, convictions and strong penalties to stop the flow of contraband.” The whole “enforcement chain” must work together to bring elephant poaching to a halt, he said. In 1975 the Asian elephant was placed on CITES’ Appendix One, which bans international trade between member countries. The African elephant was placed on Appendix One in 1990, resulting in a worldwide ivory trade ban. But in 1999 and also in 2008 CITES allowed legal sales of government ivory stockpiles, acquired from elephants that died of natural causes, problem animals and ivory confiscated from poachers. Proponents argued that the sales would yield conservation funding and the low prices would diminish demand for high-priced illegal ivory. So, after nearly a decade without legal ivory sales, CITES permitted four auctions in 2008 during which Namibia, Zimbabwe, South Africa and Botswana sold a total of about 116 tonnes of ivory. Conservationists have long argued that permitting legal ivory sales masks illegal sales and encourages poaching. 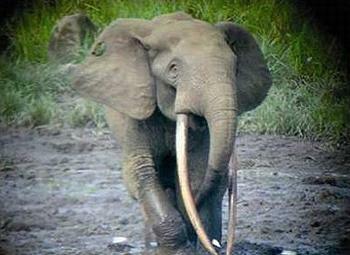 Now it appears the world is again in the throes of an elephant poaching crisis that Gabon is acting to combat.